For more than two decades Michigan has offered parents a limited opportunity to enroll their children in public schools other than the ones assigned to them based on where they live. While this opportunity is limited by the discretion of conventional districts and the capacity of charter schools, overall use of choice has steadily grown. 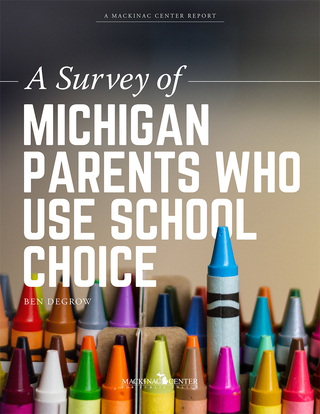 This is the first known systematic survey of Michigan parents statewide who exercise public school choice. It provides a valuable piece of the picture to better understand parents’ perceptions and opinions of their school choice experience. Parental decisions about education reflect the unique needs and character of their own children. Still, several key general lessons emerge from the survey’s findings. Parents tend to be satisfied with their choices. Large shares of Michigan’s school choice users highly rate the options they have been able to select. And low-income and African-American parents in particular report greater expectations for their children due to their experience with choice. Parents tend to see academics as the most important factor in choosing a school, but standardized test scores aren’t necessarily driving decisions. Two-thirds of parents identified academic factors as the most important feature for choosing a school. Objective measures of academic performance carry great weight with some parents, but demand for different educational programs or philosophies is at least as strong a driver. African-American parents are more likely to highly value test score data in their decisions, but there appears to be no difference based on family income. Parents pay attention to other parents’ experiences. While school choice users appear to rely on a variety of sources to inform their decisions, nothing carries greater weight than the insights of other parents with whom they interact. It isn’t clear to what extent this finding is driven by the power of informal social networks, or to what extent parents value access to more meaningful information about school quality and characteristics. This finding provides an opening for some choice schools to make information about education options more useful and readily available and to make the application process and paperwork less burdensome. As Michigan policymakers address growing demand for educational alternatives, the voices of parents who benefit from these policies should be given prominent consideration.